All the testimonials below were supplied by clients that I have worked with over the past years. If you are interested in contacting any of the clients that wrote a testimonial please send an email to me at jaaechef@gmail.com and I will supply with the contact information requested. Thanks for stopping by and I look forward to hearing from you! Pam and I want to thank you for all your great counsel / work in the purchase of the home for Jake. Not only were you highly competent and professional but surprisingly, ENJOYABLE to work with. You are incredibly lucky - you've already found the most professional, experienced, trustworthy, client focused, and patient human being on planet Earth! When you find a Realtor® who knows what you want better than even you know yourself, you've got somebody special. Believe me, we recognize a true gem in the real estate industry as we have bought and sold dozens of homes over the past 30 years. Cloning Joseph and having his invaluable guidance and expertise available in past transactions would have eliminated many disastrous experiences and certainly would have greatly reduced the number of gray hairs on our heads! Joseph really knows his stuff! Best of all when you find that perfect home, Joseph shines in getting the deal negotiated as he helped us get into our dream home for $50K less than the asking price. It has been a real pleasure to work with someone whose primary interest was to find us what we wanted, rather than trying to get us into something that was easy for him. After showing us literally dozens of homes in a crazy-fast 5-day whirlwind tour, Joseph scheduled an appointment for a “mystery house” that he said he wanted us to see before he gave us any of the details. It was love at first sight and we still cannot believe we were able to get our dream home under contract within 24 hours of deciding on it. Back in the USA and freaking out about the adventure we were about to embark upon, he always took the time to call us, keep us in the loop, and update us on every step of the process; from start to closing (and even afterwards)! It has truly been a pleasure working with such a knowledgeable, compassionate, and tolerant individual! Joseph was (and still is) a true lifesaver! We can honestly say that without him, we would have never successfully made the move from the USA to Costa Rica. Joseph made (and still makes) himself available to us anytime we needed/need him no matter the day or the time. Throughout our entire journey (including now) he was/still is always by our side or just a phone call, email, or text away (and there were/are still MANY!). It is a true challenge to be concise in describing all Joseph Emanuelli has done for our family! He possesses the uncanny ability to make you feel as if you are his only client and he delivers on everything he commits to with integrity. We truly appreciate all the past (as well as present) help he has provided to us - initially navigating the myriad of unfamiliar paperwork in a greatly-accelerated closing timeline (less than 30 days), and currently being our ongoing resource for all things Costa Rica. Thank you, Joseph, from the bottom of our hearts – references as well as friends for life! It has been a great pleasure to work with Joseph Emanuelli. He is truly an outstanding real estate agent. I meet Joseph 5 years ago while visiting and inquiring about property in Costa Rica. I was very impressed by Joseph’s ability to respond within 24 hours to any questions relating to the process of my real estate transaction. His skills in coordinating between my attorney and escrow made closing very smooth. 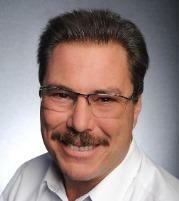 I would highly recommend the expertise of Joseph Emanuelli for purchasing real estate in Costa Rica. My husband and I had visited Costa Rica several times in the past, and we fell in love with the country. We loved how safe we felt in Costa Rica compaired to other places we had visited in the past. We liked the stability of government, and that they provided for the people with education, healthcare, and a pension plan. We loved how the country is concerned about the environment and conservation. Of course our number one item of things we loved is the biodiversity and beauty of the country, and all the outdoor excursions to be had! That being said we decided we would love to own a place in Costa Rica, but how would we swing that, as most purchases are cash in Costa Rica and we didn’t have $300,000 sitting around unused. 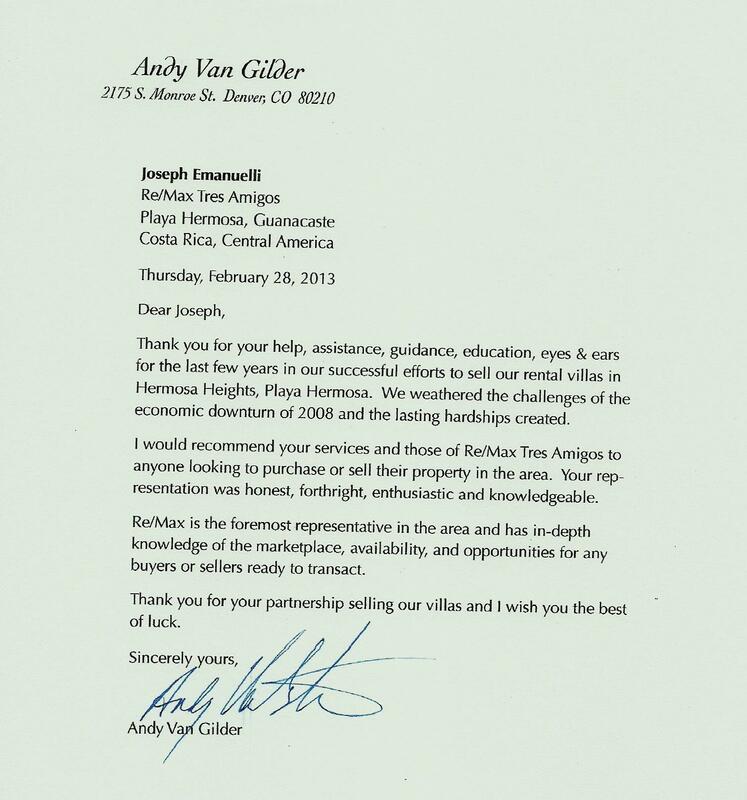 That’s how we stumbled on to Joseph Emanuelli at Remax in Paya Hermosa and he had a solution. I should first explain how we chose Playa Hermosa as our desired destination to purchase. As I said earlier, we had toured around Costa Rica in the past flying into San Jose, and visiting that area. I dragged my husband to Nosara based on HGTV shows I had seen in the past, and determined way too difficult of a drive for us for a quick get away. Then on another trip we flew into Liberia, and stayed at hotel in Playa Panama near Playa Hermosa. We asked our waiter for dinner suggestions outside the resort and he suggested a restaurant on the beach at Playa Hermosa. We loved the quiet undeveloped beach of Playa Hermosa with multiple small restaurants plotted along the coast. We loved the calm waters for a swim or paddleboard, or quick kayak trip to the white sand beaches. We loved that it only took us 20 minutes from the small manageable airport to arrive to Playa Hermosa. We liked that the town of Playa Del Coco a much larger city was just a few miles away offering us any amenities we might need. We decided this was the perfect location for us. Back to Joseph, as we were standing outside the Remax office viewing flyers posted on the wall he approached us and offered assistance. We told him how we loved Costa Rica and were interested in purchasing a future retirement spot/ rental income property. He offered to show us a few properties right there on the spot. We ended up falling in love with a three bedroom condo a block from the beach. We were not ready to purchase at this time, so we returned to the states. We kept contact with Joseph via email while we were at home, and he answered the million questions I had about purchasing a property abroad. He also continued to forward me many properties that I might be interested in for me to view online. After several months, we decided to visit Costa Rica again and look a little more seriously at the properties on the market that met our criteria with Joseph’s assistance. Joseph was extremely knowledgeable about the area, and the country, and the purchasing options in Costa Rica. We never felt any pressure to purchase quickly. I think we surprised Joseph when we told him we ready to make an offer, but we had to figure out how to pay for it… Joseph suggested we look into a Self- Directed IRA to invest some of our retirement money into a rental property. Joseph was very helpful in recommending a couple lawyers in Costa Rica who could help us explore these options. After meeting with lawyers in Costa Rica, and our financial planner and lawyers in the U.S. we decided the Self-Directed IRA was the right option for us. We signed the offer while we were in Costa Rica, and Joseph assisted us in negotiating a fair deal. We completed all the remaining paperwork from the United States. 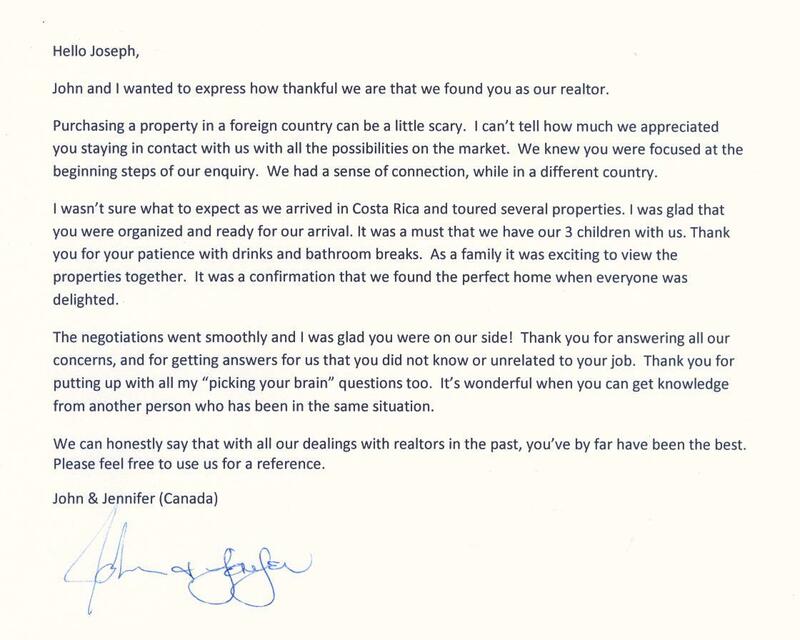 Joseph assisted us every step of the way and made purchasing a property out of the country as painless as possible. He was available for any questions anytime and responded very promptly, and he offered solutions to any hurdles we came across. We have owned our property in Costa Rica for nearly a year and are very happy with our investment. Joseph still answers any questions regarding Costa Rica I have very promptly. I don’t ask him questions so much about real estate anymore, but mostly about places to visits and recommendations, and he is still very helpful. We would definitely use or recommend Joseph again when we decide to upgrade for full time retirement! well, even though I was back in the United States. Thank you for everything Joseph. Kate and I met Joe initially through the Remax website while we were beginning our move out of the middle east to Costa Rica. We knew the Guanacaste area was where we wanted to live, grow roots and start a business. After a year of email exchange and 8,000 miles later we finally met Joe to start our search to buy a restaurant and start our new chapter... breathing fresh air. Joe’s knowledge of the area, the real estate market, and cultural norms were instrumental in our ability to not only buy a restaurant, but also a condo, both nearly at the same time. It was a whirlwind to say the least, Joe’s confidence and guidance lead us through the process without issue. He knew the right price points for both the restaurant and condo, his guidance in negotiations was spot on; we could not have been happier. And when it came to starting utilities, banking, or just needing a screw driver, Joe was there to assist. Although I can go on and on about what he did, I think what is more noteworthy is his sincerity about what he does and the people he helps. When the deals are done, Joe is not. His follow-through and attention to detail are remarkable. He has become a close friend and confidan. We call him Tio Jose because everyone needs an Uncle Joe, he’s ours. Sorry Joe, you’re stuck with us! 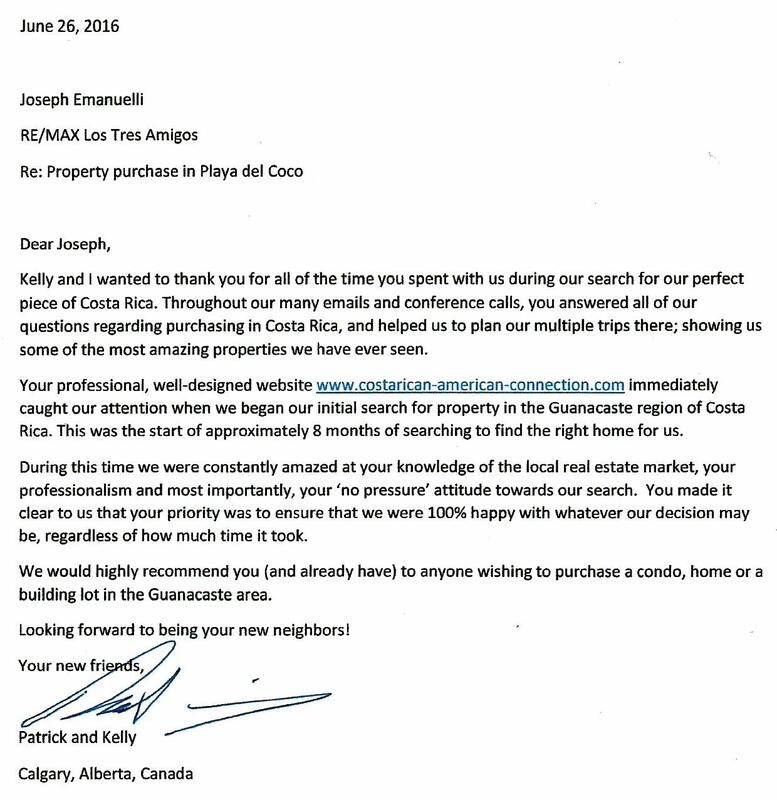 Subject: Re: RE/MAX Costa Rica Connection Calling! 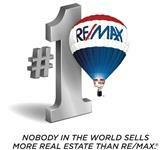 Congratulations again on being one of a select few to achieve the RE-Max Hall of Fame status. There are many good reasons for you being selected to receive that award over and above the sales target. First and foremost, you put the interests of the buyer first and listen to their objectives and concerns. You go above and beyond to make sure the deal is right and fair for the buyer and represent both buyers and sellers with the utmost professionalism. All this being said I would never hesitate to recommend you to anyone seeking their little slice of paradise in Costa Rica. No thanks are necessary from you, we thank you for your honesty, integrity and moreover just being a good human being. I want to thank you for your hard work and perseverance in selling our Condo. I know it wasn't easy! Your professionalism throughout the the entire process was well appreciated. My wife Kim and I visited Costa Rica two years ago and fell in love with the Guanacaste area. We decided to purchase a retirement home/investment property in Costa Rica. We looked around for a knowledgeable real estate agent who was also familiar with the legalities of a non resident purchasing property there. We talked with Joe several times prior to our visit this past February and he was extremely well prepared with not only properties that suited what we were looking for but financing options as well. We purchased our property through an IRA and Joe was incredibly knowledgeable about that process and recommended an investment firm to work with, a Costa Rican lawyer to handle the legal paperwork, and a property management company to handle the rentals after the purchase. From the time spent with us to find the right property for us to the recommendations on all of the professionals to handle the sale and management of our condominium, Joe’s expertise made our dream come true. We will buy another property in the future and will not even consider using another real estate agent. We are convinced that we would not have realized our dream without Joe. We have purchased many properties over the years and have never had an agent of Joe’s caliber. If you are considering buying property in Costa Rica, Joe is the best choice for your real estate agent. Over a year ago, my husband and I began researching possible vacation/retirement properties in Central America. Once we had focused in on Costa Rica, and specifically the Northern Pacific coast, I contacted Joseph Emanuelli with Tres Amigos ReMax for more information on some listings. Joseph not only provided information on the listings, he spent considerable time via emails and two extended phone conversations to help me learn about and understand about the country, the local area, and aspects of Costa Rica real estate, taxation, market trends, financing, insurance, shopping, healthcare, and transportation. We decided to take a trip to the Playa Ocotal/Playas del Coco area in July 2017 to see how we liked the area and to look at some properties. Joseph spent two days showing us the area and several purchase options he identified based on our stated criteria. He was professional but easygoing and we never felt pressured to make decisions. We left knowing we were very interested in that area but without making any offers. We returned in October 2017 with a more focused idea of what we wanted, and Joseph showed us a few more properties. We settled on a choice in Playa Ocotal, and with Joseph’s assistance, we finalized a contract. Trying to close a property in a country that is not your own and being thousands of miles away is a challenging proposition. Joseph connected us with legal, inspection, financial, and insurance professionals who were extremely competent and did a great job for us. Joseph made himself available in our stead whenever needed. This included opening our unit, turning on electricity, water, and lights so we could walk right in when we returned and immediately enjoy our new condo without worries or complications. We have never had a need that Joseph hasn’t addressed promptly and satisfactorily. I am confident that we can turn to him for similar assistance at any time, even though our real estate transaction is now complete. We readily recommend Joseph to anyone considering the purchase of property in Guanacaste, Costa Rica. If you are looking for a great realtor in Costa Rica, it will be worth your time to spend the next 5 minutes reading this review. When we first decided to look into Costa Rica as a location to purchase a vacation home, we didn't know where to even begin. Start with an honest, experienced, professional and pleasant realtor. But who? And where do you find one? Often enough, it is luck of the draw and we all know how that may or may not be in your favor. We were lucky. So lucky. And now you are lucky. We stumbled upon Joseph Emanuelli with ReMax Tres Amigos Realty company. One inquiry and we were promptly contacted and the first conference call scheduled. Sitting at the kitchen table, both nervous and excited, the phone rang right on time. The most friendly and energetic voice came over the iPhone speaker and we looked at each other a bit puzzled....Emanuelli....I was prepared to attempt my broken first grade Spanish but this guy was speaking English...with a hint of New York accent!? Joseph went on to explain he lived in the US for the majority of his life before following his dreams and residing in the amazing country of Costa Rica for almost 10 years. Do you know how many benefits comes with Joe's background? Score for us. Score for you. Joseph is not only knowledgeable about the real estate in Costa Rica, he knows inside and out the process for foreigners to purchase property in this country. In addition to directing us to exactly the right properties that met our requirements, Joe was able to connect us with many trustworthy service partners (escrow, legal, property management, banking, etc., just to name a few) which made the entire process seamless. From day one, Joseph treated us with the utmost respect & literally went out of his way to make us feel like family. He was always quick to respond to our many, many questions, making us feel as though we were his only clients and always putting our best interests first. He will be honest with you. He is not pushy. He has the patience of the Dali Lama. We were fortunate to find our property within weeks but he has many clients that he spends months or even years helping them seek their perfect choice of real estate. He is not happy until you are happy. To sum up, our entire experience working with Joe, it was one of the best adventures in our lives thus far. Joseph Emanuelli provided the most professional, informative, loyal and dedicated service that one could hope for, he absolutely delivered his promise of helping us purchase our first home in Costa Rica. We found both an outstanding Realtor and a true friend for life. If you are looking for an ethical realtor, a straight shooter, someone that will tell you a fair price and work hard to sell your property, look no further than Joseph Emanuelli. Joe was involved either as the seller’s listing agent or as my agent on the purchase and subsequent sale of two properties, one in Playa Hermosa and the other in Playas del Coco. Buying in Costa Rica requires knowledge of the local laws and areas that can cause issues down the path. As an example, a condo that I bought had a tax value in the municipality of 3 times the value of the property. Joe found this out and worked with my lawyer to get this fixed before closing which saved me hundreds of dollars in property tax down the road. This is just one example of his thoroughness in working with you. He's fun, very responsive and hard working. I highly recommend him if you’re looking to buy or getting ready to sell. Lynore and I are so pleased with our purchase of the wonderful condo at Villa Sol Resort in Playa Hermosa and realizing our dream of owning property in this beautiful part of Costa Rica. What I would like prospective clients of yours to know, about you, is how above and beyond you went as our broker in achieving this dream. Certainly, you provided all with the basics one would expect in a great real estate broker: showing us a number of properties that met our objectives, graciously dealing with all the questions we asked, and helping us negotiate a good deal with the seller. Above and beyond, you guided us through the complexities of buying and owning land in another county, including the due diligence and closing process, recommending property managers and contractors, and ideas on how to best rent out our new property. We hope that all future buyers (and sellers) of property in the Guanacaste region have the opportunity to work with you and ReMax Tres Amigos. Thanks for all your great customer service. Thanks for doing such a great job selling our condo. You are so good at your job! We both have enjoyed knowing you and wish you all the best in the future. I hope all is well with you as it’s been a while since we have been in touch. I would like to thank you for all the help you gave us when we purchased our condo. You made the process so easy to understand and everyone you recommended from the lawyer to the bank have been just great to work with and I would certainly recommend them to anyone else considering buying there. Our condo has been great and we would do it again. We have done a lot of real estate transactions in Canada and the U.S and dealt with many real estate agencies and brokers and I would rate your knowledge of the process at the top of the list. Having said that I think one of the best parts was driving around and visiting with you and getting to know you and getting to know so much about the area, I’m sure we ended up knowing more about Playa Hermosa in those drives than people who have lived there for a few years. I would like to take the time to thank Joseph for all the hard work he did for our family. We are first time Condo buyers in Playa del Coco, Costa Rica. I initially choose Joseph because when I contacted 3 realtor's to book viewings in 3 towns, he was the one that returned my inquiry within 20 min! I bombarded him with questions as it is a daunting endeavor to buy in a foreign country. He was on the ball at every turn. He answered every single question. His answers were precise and knowledgeable. When we met him he took us all over town and we saw many properties in our price range. He was able to read me right away and know what I was looking for. Through the purchasing process, he was there to translate documents and he even ironed out a situation on the contract with grace. He went above and beyond, picking me up at the airport when I came down to sign for our Condo. My husband and I would recommend Joseph and we will be using his services in the future for our next Condo. Please feel free to contact me if you wish to confirm. Thank you very much for your excellent work in handling the sale of unit 1-A at Sol y Mar in Playa Hermosa, Guanacaste, Costa Rica, for us. You were very polite, professional and effective as a no-nonsense sales agent. You used common sense about pricing and good talent skills at selling. You were very patient and good at smoothing all the bumps normal of a Real Estate transaction, very important when both, sellers and buyers live in foreign countries. Please use this as a letter of recommendation to any of your future clients. This is a long overdue thank you note. Diane and I want to express our thanks and appreciation for all your help in purchasing our lot in Hermosa. where to eat tips, unbiased viewpoints on property, all of this beyond the "Call of Duty" for a Real Estate agent. Thanks also for your patience, your friendly, no pressure attitude. We have told our friends if they need a solid honest and hard working agent in Costa Rica that you are the "Go To " guy. Please feel free to use our names as a reference for any potential clients. I am a Canadian living in Costa Rica. I built two houses for sale at the height of the housing bubble. I can't think of many good things that came out of that investment, but one that did come out of it was my friendship with Joe. I had a variety of agents trying to sell my houses, and by far and away Joe was the hardest working of any of the agents I dealt with. What I most appreciated though in working with Joe was the fact that he was a straight shooter, telling me sometimes that there was no one looking even close to my price range for the houses, and one other time telling me that there really wasn't much point in lowering the sale price as the market was just not moving. If I were ever to sell (or to buy) a house in the region that joe works in, in Guanacaste, there is no question in my mind that I would use Joe as the agent. I would be happy to serve as a reference should anyone have any questions about my dealings with Joe. are “sloppy”, “brutish” and “not-on-the-up-and-up” – to put it most politely. the sale in a relaxed and an almost “giddy” atmosphere. I just wanted to take a moment, on my wife’s behalf as well, to thank you for being a high-quality real-estate agent, more than the ones I have worked with in the past, bar none. That’s actually saying a lot when you consider that I’ve worked with several over the past almost-forty years! First and foremost, you take customer service to an extremely high level. You surpassed our expectations! For starters you have been every bit the equivalent of a home inspector with every home we viewed, irrespective of whether it was your listing or a different agent’s. Whether it was wall cracks, slightly sloping floors, or loose pool tiles……you didn’t miss anything to my knowledge. We always felt like you ‘had our back’. We also especially appreciated your negotiation skills on our behalf whether it was the purchase negotiations or the complexities related to our easement issue. Speaking of which, we were particularly impressed with your suggestion to the topographer that contributed to the resolution; without costing the seller an arm and a leg. While you weren’t actually dispensing legal advice, I have to say that on several occasions your input on the overall process provided such useful information that we probably reduced our legal bills, as well! Joseph, any opportunity that we get to refer you, your blog, your website, etc., we will do so without any hesitation and extend the highest recommendation we can. We look forward to seeing you again, in Costa Rica! Below is an email I received from the organizers of C.A.R.E. ( Coco Animal Rescue and Education) This is a group of loving expats that live in surrounding area of Playa Del Coco. This great organization helps unwanted dogs and cats that are in dire need of medical care and loving homes. The group also does a monthly spaying for only $10.00. Local vets donate their time for free and the cost is just to cover the supplies and medicines needed to perform this service. To date from 2004 the group has spayed over 2000 animals and has adopted out or taken care of hundreds of unwanted pets. This is a great group of people helping out one of nature’s great animals. To help C.A.R.E. visit their Facebook page and like it and contribute. Happy New Year to you! Hope 2014 is a great year for you. Purchasing a condo in a foreign country with your help was easier than we thought! We definitely felt that you were looking out for our best interest and for that we thank you :) We are very happy with our purchase and will definitely be in touch in the future should we decide to purchase another property in Costa Rica. You can also be sure that we would recommend you to anyone we know looking to make investments in Costa Rica. Thanks again for all your help! We can’t wait to come back. My husband and I have been traveling to Costa Rica for a few years now and as you know, recently decided to buy a home after considering Costa Rica and a handful of other countries where there is no ice in the winter, as you know we live in Toronto! I cannot tell you what a pleasure it was to work with you. I have worked with several agents over the years buying and selling various homes. You were so knowledgeable, professional, courteous and above all, you responded quickly to each phone call and email as we went through the offer and closing process. You introduced us to the lawyer, who met with us on very little notice and who has also done an excellent job in preparing all our documentation—Roland Gonzalez Calderon. In addition, you managed to introduce us to two property management firms very promptly as soon as our offer was accepted. In short, we could not have found a better agent in Costa Rica than you. As you know, we had done our homework and knew what qualities we were looking for in a house. You were able to give us valuable local insights and guidance we hadn’t considered and helped us choose a home that met our specific needs. Thank you so very much for helping us buy the house of our dreams. we don't want any more time to elapse without writing you a brief note. The days after the sale have been hectic, but now all is under control! We wish to thank you from the bottom of our hearts for all your kindness and patience in helping us sell our house. We are pretty sure that without your assistance and help and, especially your knowledge of the "rules of the game" and diplomacy, we would not have succeeded. Your advice has always been more than precious and to the point and you have always helped us in keeping our spirits high. In just one word (actually two): THANK YOU! You can count on us to recommend your services to our friends and acquaintances and we know that they will be grateful for it. We had the pleasure of working with Joseph over the last year to locate that perfect piece of property in Playa Hermosa. From day one, he had made it his goal to help us understand what Cosa Rica had to offer and the options that were available. Not only did Joseph show us properties, but he also provided a tour of the area showing us restaurants, grocery stores, shopping, attorneys, banks, and of course the best places to see those sunsets. Joseph has gone above and beyond in what you would expect from a real estate agent. No matter what the obstacle, he found a way around it! He looked out for our best interests and we sincerely thank him for his assistance. I would certainly recommend Joseph to anyone who may be looking for real estate in Costa Rica. Joseph is the BEST! Thank you for your assistance, you’re more than a real estate agent, you are real friend. On behalf of my husband and me, we want to thank Joseph Emanuelli for selling our condo at Villa La Colina. His honesty and hard work ethic should be commended. We have worked with Joseph during a very difficult economic time. He was always upfront and honest with us and allowed us to make informed decisions throughout the process. Joseph exhibits great communication skills and always kept us up to date on the Costa Rica Real Estate market and our condo. During the closing process, we felt very comfortable with Joseph as our proxy. Joseph takes great pride in his work and truly enjoys what he does. Please allow us to thank Joseph for a job well done as determination and perseverance helped us complete the sale of our condo. Willow and I would like to express our appreciation to you for your efforts in making our relocation to Ocotal Beach from Oklahoma City a success. We have been buying and selling homes/condos/ranches for over 40 years in the United States from New York to California with several points in between. We have yet to find a Real Estate agent that has gone to the lengths you have to make our transition as smooth as it has gone. While one may have expected this extra effort if he/she was purchasing a million dollar home, our relationship began on the internet with an inquiry about a condo in Ocotal Beach listed at $65,000. Not only did you not blow us off as just another internet inquiry, you remained patient as we shared several special needs that we required due to sensitivities which can be life threatening to Willow. We also commend you for doing your best to represent both our interests as well as the seller's interests during our transaction as the condo we purchased was one of your listings. That was pretty amazing with you living in Hermosa, the seller living in New York, us living in Oklahoma and the condo being located in Ocotal. As everyone knows, things can be complicated after a move as one adjusts to new utility companies, new banks, a new insurance agent, a new cable company, getting a new drivers license, coordinating the move itself, adjusting to new surroundings, and learning the quirks of the new residence. These can be challenging enough moving to a new city or state in the United States but they multiply when the move is to another Country with an official language you have not spoken since High School. We cannot thank you enough for getting us through this transition. You did everything you said you would do plus some including coming to our new Condo and making sure we had hot water----after we did not realize that the breaker switch was not turned on. We would not hesitate to recommend you to either a seller or buyer involved in a real estate transaction. I am writing to tell you how much I appreciate all of the hard work that you put in to into marketing and selling my ocean view lot in Playa Hermosa. Your pricing recommendation was right on the mark, and it sold quickly. The thing I was most impressed with was your continued follow up with the buyer, and the attorney. We all know that it is sometimes scary to do business in a foreign country, but you made sure everything went smoothly! I will certainly call on you again to help me with my other properties in Costa Rica. Thanks again. I just want to thank you once again for the wonderful job you did for us in marketing, buying and selling multiple properties in Costa Rica. I knew from the moment I met you that you would be the person to finally work with. Your knowledge of local area, current market conditions, the beautiful marketing brochures and continuous advertising, along with the way you treat any customer with honesty, great enthusiasm and professionalism definitely sets you apart and in my opinion. Well above the other Realtors we meet by far. We have been buying and developing properties in Hermosa, Guanacaste area in Costa Rica for many years and have worked with a host of Realtors, and I must say, that you are by far the most impressive professional we have ever met. Your attention to the details, prompt communicating with us on any issue and request, focus on the project, service from marketing, showing, attorney recommendation, all the way through closing and even post closing is amazing. That explains why you are the #1 agent in our opinion. We wish you the best of luck. I am certain you will continue to be extremely successful. Anyone who is lucky enough to see your talents and have you represent them in either a buy or a sale will be greatly pleased with your efforts. You really shine. The trust you earned from us make us feel that we are working with friend not with Realtor. I am sure anyone that has the opportunity to work with you will feel the same way. If you would ever like to give my name and number out for a reference, please do not hesitate. Just wanted to send you and Remax Tres Amigos a note thanking you for your recent help in purchasing my first property at Pacifico in Playa Del Coco. Although I was a motivated buyer in that I had fallen in love with the country, people and Guanacaste area of Costa Rica It was a bit scary for me at first to think I would actually purchase property foreign country. You made the process easy. 1. You and your partners at Remax Tres Amigos were very knowledgeable about the area as well as the available real estate inventory. 2. Your no pressure approach to helping me decide on a property that was right for me and helping me get all of my questions answered up front. 5. Your on-going after sales support to help me meet people in the area and get settled in. 6. The fact that you are always there and willing to go well beyond the traditional real estate services into things like helping me get a bank account set up, applying for residency, finding a good lawyer / accountant, etc. Speaks tremendously to your commitment to not just selling real estate but really taking care of your clients. Thank you Joe and I look forward to getting to know you and all the wonderful people I have met down there that I can now call my friends better. Looking forward to seeing you again next trip. I want to thank you very much and I appreciate all of the hard work that you put in to marketing and selling my ocean view property in Palo Alto. Even though you only had a three month listing agreement you got it done in time. Your recommendations to “open up the view” and get the property “cleaned and cut” could not have been better, which believe helped bring the buyer quickly. If it was not for your marketing efforts, dedication and drive to help us out we would most likely still own the property. As being a licensed real estate agent in Arizona I know how hard it can be to get a deal done from offer through due diligence to actually closing I am grateful for your follow up with the attorneys and the buyers to see it to the end. We all know doing transactions in a foreign country can be a daunting task if you do not have the right people in place, but you made sure everything went smoothly. It is unfortunate that we had to give up our dream of retiring to Costa Rica but you left a lasting impression of what makes Costa Rica so great. I will certainly recommend you to anyone that is interested in buying in Costa Rica. After an incredibly relaxing and fulfilling vacation in CR, we decided we wanted to make this beautiful place our home. We did a great deal of research and after numerous correspondences with realtors who had no interest in finding us a property which not only could we afford, but also one which we could call home, we were fortunate enough to meet Joe. The first day we met, we knew he was the right man to help us and one we wanted to get to know better. He took us to at least 7 properties, all within budget and meeting most of our expectations. After only two trips back, he found us our future home. Joe is attentive; while he has a world of knowledge and experience he also listens. We could have spent an enormous amount of time and money searching for prospective properties but we didn’t. Joe listened to what we wanted and he focused on our wants and needs. He is a genuinely good man who wants nothing more than to provide satisfaction for his client. We have been fortunate enough to be able to call him a friend, not just a terrific Broker. He and his wife are truly good people, people you want to know and spend time with. My husband and I are truly thankful we have met such a terrific man and that we will soon be calling Costa Rica our home. This email is sent to you to thank you for your services in the process of selling my house. I know there were a lot of problems dealing with the legalities of the corporation, the social security department and without your professionalism, your knowledge of the law and your persistence and follow through work, I do not believe that the closing would have been realized. I will not hesitate to recommend your services to anyone whom shall need a good, honest hardworking, ethical and professional real estate agent. It is very easy to write a letter of recommendation for Joseph. Our experience with him, and by extension with Remax, has been wonderful. Joseph's professionalism and commitment are expressed in equal measures. As a property owner that lives in the United States, there is a trust beyond the normal experience of buying or selling a home in the area in which you live. There was never a time that we felt Joseph had anything but our best interest as his motivation. We would recommend him on either side of a real estate transaction. Playa Hermosa, GU 50503 Phone: 506-2672-4100 Mobile: 011-506-8358-6617 Fax: 506-2672-0254 Email Joseph A.